For those wondering, is there a documentary on Shenzhen villages out there? The answer is yes and its 15 hours long! CCTV and SZTV produced 沧海桑田：深圳村庄30年, a 30-episode television documentary to commemorate the SEZ’s 30th anniversary. Not unexpectedly, the documentary’s ultimate happy end is urbane Shenzhen. Nevertheless, each of the 30 episodes does raise issues worth talking about and also gives current Party takes on these issues, which is always useful information. In fact, that take may be the point; the commemoration of the SEZ’s 30th Anniversary included a more inclusive and nuanced understanding of pre-reform Baoan society and history, reminding us that the villages no longer exist as such. What remains are ideological and economic struggles over the properties held by [former village] stock-holding corporations that have not yet been fully integrated into the Municipality’s urban apparatus. That said, however, there is also the question of what a truly integrated Shenzhen society might look like. And consequently it is interesting and hopeful to think that the economic questions may also force re-evalution of who belongs in the city. So, how are those ideological battles being waged in the contemporary SEZ? Through interviews about and images of rags to riches transformation. Indeed, villagers, scholars, and journalists consistently point to the area’s pre-Reform poverty in order to affirm the Party’s decision to reform and open the Maoist planned economy. Shenzhen University professor Sun Weimin (in another neo-Confucian reference) called the area’s “correct name”. In episode 1, “黑潮下的血路 (The Bloody Road Beneath the Black Tide)” we learn that the area’s unique history includes poverty so extreme that villagers were forced to make otherwise unthinkable decisions; in fact, the documentary figures this poverty as the origin of contemporary Shenzhen, opening with a description of how the 20 households (70-odd members) of Maliao village (马料村) jumped on to a boat headed for Hong Kong and were never heard from again. Nor was Maliao unique. “Ghost villages” haunted the landscape and the County witnessed four large tides of illegal immigration to Hong Kong – 1957, 1961, 1972, and ironically, 1979. Now here’s the thing. Under Mao, economic refugees were considered “class traitors”, or as we used to say when I was a Cold War elementary school student “defectors” (see picture at the top of the post). However, the current SEZ take on the mass exodus is that a government’s success and failure is directly expressed through the quality of ordinary peoples’ lives. 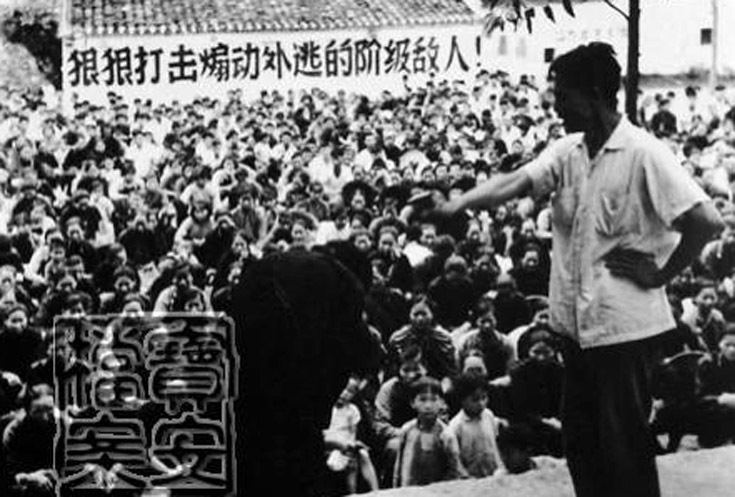 In other words, Shenzhen’s villagers are being incorporated into the Municipality’s history (or true name) as the sign of Maoism’s failures and Reform’s successes, begging the question, when and how did their success become a problem for the city? This entry was posted in noted and tagged 30th anniversary, cold war, cosmography, documentary television series, history, ideology, neoliberalism, response, rural urbanization, urban village, urbane urbanization, 沧海桑田深圳村庄30年. Bookmark the permalink.